Wait a minute... so you "made" your own magazine? LMAO. I think I love you. HIRE ME! Can I be your cartoonist? UPDATE. 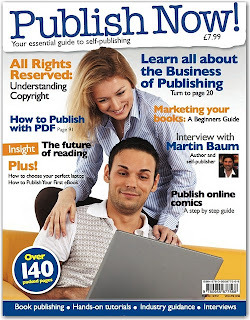 I'm a columnist again... this time for the BEST SELLING writing magazine in the UK!! I'll be their social media columnist for the rest of 2011. Total dream come true. SO glad that this magazine fell through or I wouldn't have got the ultimate dream word nerd gig! LOL! Just saw this post again. Classic example of things going SO right after they go wrong. I've been writing for Writing Magazine for over a year now and YES they're keeping me on next year. Utterly love it. Not an opportunity I would have had if this hadn't fallen through. What is there in your life that you look at as a failure that is actually a stepping stone to what you REALLY want?